A different attitude to greet Obama’s 2nd inauguration, per new NBC/WSJ poll… “Cope” instead of “hope”… But Obama remains popular in poll… The same isn’t true of the GOP, Congress… Majority supports broad principle of gun control (but there’s a big divide between gun owners and non-gun owners)… Majority also backs immigration reform (but there’s a big divide between Dems and GOPers)… And Obama World sets up Organizing for Action. When President Barack Obama was first elected his term focused on "hope," but that doesn't seem to be the case anymore. Americans have grown more pessimistic about their leaders in Washington and they think those leaders are hurting the economy. The Daily Rundown's Chuck Todd reports. 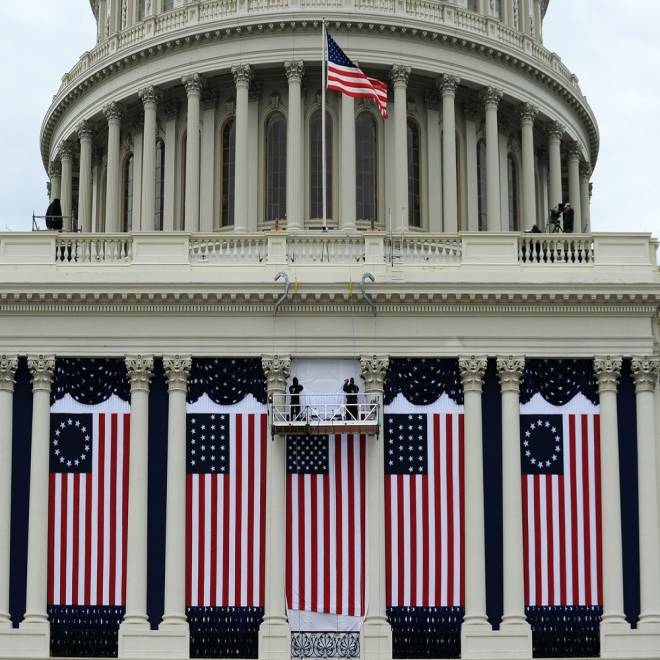 Two workers adjust flags on the Capitol as preparations continue for the second inauguration of President Barack Obama in Washington, DC, on Jan. 17, 2013. *** But Obama remains popular: Despite this sour attitude, the American public continues to like Obama. He finds himself with a job-approval rating at 52% among all adults, and majorities support his general direction on gun control and immigration reform. As for views on his qualities as president, Obama gets the best marks for being easygoing and likeable (61% give him high marks here), having the ability to handle a crisis (55%), being compassionate (53%), being knowledgeable and experienced (53%) and being a good commander-in-chief (51%). His lowest marks come on achieving his goals (44%), working effectively with Congress (29%) and changing business as usual in Washington (28%). Also, the public doesn’t have a lot of confidence in his economic stewardship: Just 36% say they are “very confident” or “fairly confident” in his ability to promote a strong and growing economy. The White House will look at these numbers and say, “Phew, at least expectations are lower this time than they were four years ago.” And that may very well be true. But the fact remains: The country wants the economy turned around; it’s the No. 1 message they want to send the president. And so far, they don’t believe he’s done it, and they are worried he can’t do it even as they hope he does. *** The same isn’t true of the GOP, Congress: Yet just like in last year’s presidential election, Obama and the Democrats are benefitting from one important thing: They public has MUCH LESS confidence in the opposition party. According to the poll, 49% hold a negative view of the Republican Party -- its highest negative rating in the survey since 2008. (In fact, it’s been higher than 49% just once in the entire history of the NBC/WSJ poll.) Only 26% have a positive view of the GOP. By comparison, the Democratic Party has a net positive rating, with 44% holding a favorable view of the party and 38% holding an unfavorable one. And the conservative Tea Party movement, which took off in Obama’s first year as president, also finds its popularity at an all-time low in the poll, with an upside-down fav/unfav of 23%/47%. What’s more, just 14 percent of adults approve of Congress’ job (which is near the all-time low in the poll), while 81 percent disapprove (which is close to its all-time high). By the way, most of the recent negative movement for the GOP is among core Republicans. The GOP was already viewed very negatively by Democrats and indies; it couldn’t really get much worse with those two groups. So this latest shift for the GOP is due to the fact that a growing number of core Republicans were not happy with how the party handled the fiscal cliff. *** On gun control: Also in the poll, 56% believe that the laws covering the sale of firearms should be stricter, compared with a combined 42 percent who want them less strict or kept the same. That’s the most support on this particular question since 2006, but it’s less than the 60%-70% who supported stricter gun laws during the 1990s, including when Congress passed an assault-weapons ban in 1994. But here’s the bigger challenge for the White House and Democrats: There’s a big divide between gun owners and non-gun owners. Per the poll, 55% of Republicans say they (or someone in their household) own a gun, compared with just 27% of Democrats who say that and 48% of independents. In addition, 61% of rural respondents have a gun in their households, versus 42% of suburban respondents and only 29% of urban dwellers. And nearly half of whites own guns (47%), while just 24% of African Americans, 24% of Latinos, and 34% of those ages 18-34. Bottom line: The members of the Obama coalition DON’T own guns, while those who are probably represented by a GOP member Congress DO own guns. If one were to map gun ownership in American, you’d see most of those folks living in the red congressional districts. And what does that mean? It’s unlikely the Republican House will budge on these issues because THEIR constituents will have a different view. *** On immigration reform: Attention Marco Rubio: Finally, our poll shows that -- for the first time -- a majority of Americans (52%) favor allowing illegal immigrants who hold jobs to apply for legal status in this country. That’s the good news if you’re a supporter of comprehensive immigration reform. But here’s the bad news: There’s a big difference by party. Democrats favor this by a 70%-28% margin. But independents oppose it 54%-43%, and Republicans oppose it 65%-33%. These numbers explain why Marco Rubio has spent so much time this week trying to sell his immigration plan to conservative media. To truly speed up the politics of immigration, it’s going to take a conservative like Rubio to persuade other conservatives that this is the path forward. *** On Organizing for Action: And First Read confirms the news that Obama's political organization “is forming an outside, nonprofit group to support the president's legislative agenda. The unprecedented move gives Obama a way to promote his agenda outside the confines of the White House and seeks to harness the energy from his re-election campaign into support for legislation. Democratic officials say the group, Organizing for Action, will be announced Friday. The nonprofit will work on key legislative battles, train future leaders and local issues around the country.” Organizing for Action will be set up as a 501c4 group, but we are told the group WILL have full disclosure of its donors (either monthly or quarterly); setting it up a 501c4 (as opposed to a Super PAC) makes it easier to legally coordinate with the White House. But the Obama folks are conceding a big point here: They can’t do the things they want to do (like the organizing, etc.) inside the Democratic Party. If this version of OFA is successful, we’re also told then don’t be surprised if this becomes Obama’s personal vehicle post-presidency, a la Bill Clinton’s Clinton Global Initiative.